1/27/2017, We got a good article in the CUESA & The Ferry Plaza Farmers Market news letter today! Come to taste our happy healthy koji fermented foods tomorrow (8am to 2 pm ) ! Umami, the elusive fifth taste, is an enigma to many Western palates: how is it savory but not necessarily salty, or meaty without the presence of meat? 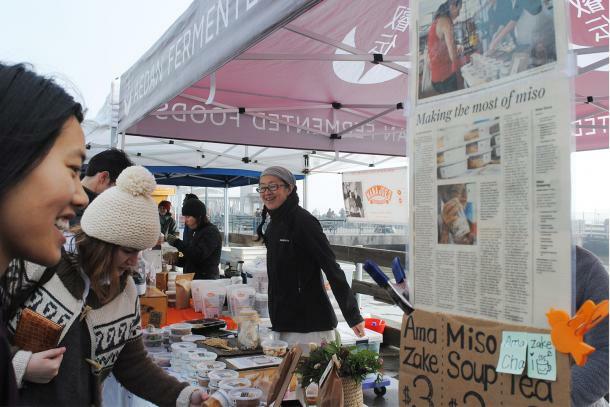 Through Aedan Fermented Foods’ umami-rich sauces and marinades, fermentation guru Mariko Grady is deepening the Bay Area’s appreciation of Japanese flavors, one palate at a time. The grilled tofu, boiled daikon turnip, and pickled watermelon radish samples at Aedan’s stand show the breadth of uses for Mariko’s products—a dollop of sweet miso sauce on some, a shio koji marinade on others. Every Saturday, these bites transform tentative shoppers into wide-eyed proponents of the flavor magic of koji fermentation. Japanese fermented foods like soy sauce, sake, and miso draw from the same ingredient family: rice, salt, soybeans, and koji—a natural, live fungus. With minor adjustments to cooking temperature and fermentation time, Mariko’s products reveal the wide array of bold flavors that koji can unleash (see tips below). From soups to sauces, and dips to dressings, most meals in Japan rely on some koji-based ingredient. In the compact quarters of the Japanese household, limited refrigerator space necessitates that each condiment serve a wide range of applications, making multifunctional miso and koji staples in kitchens across Japan. Easy to use and rich in probiotics, these fermented foods inspire a philosophy of holistic living, in Mariko’s view. Even the production process embodies a simpler, homegrown ethos that connects us back to nature. 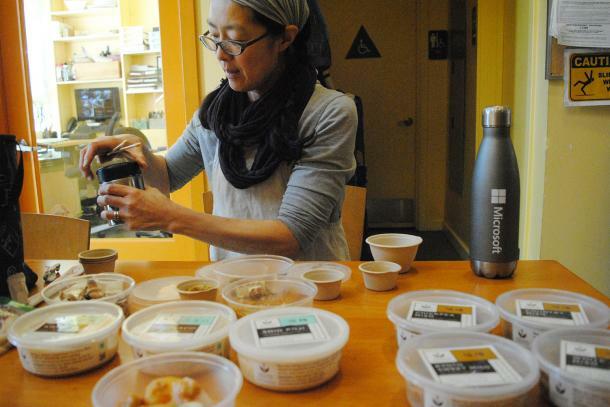 “This miso is made just with room-temperature microorganisms working for us,” she says. Aedan Fermented Foods was a serendipitous byproduct of a philanthropic project. 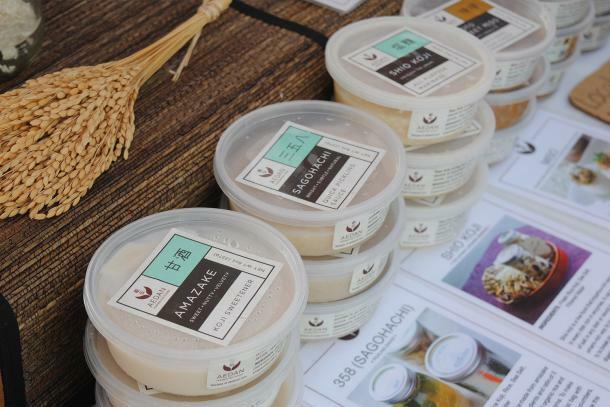 Following the Fukushima earthquake and tsunami in 2011, Mariko began selling her miso to raise money for relief efforts in Japan. Making miso was an easy decision for the former performance artist, who already produced it regularly for her family. “In my performing arts life, we traveled, sometimes on world-wide tours, and always, I bring koji from Japan and make miso for my family,” says Mariko. 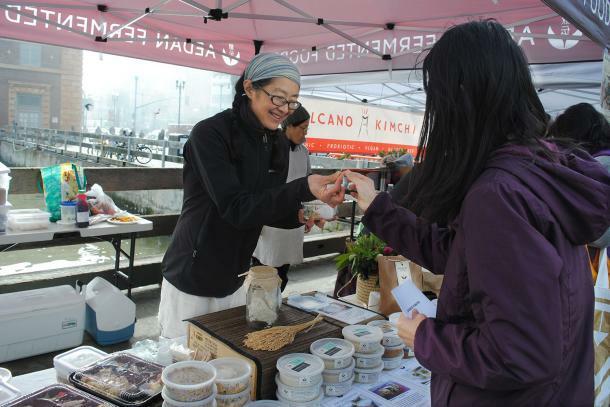 Find Aedan Fermented Foods on Saturdays at the Ferry Plaza Farmers Market in the south driveway. 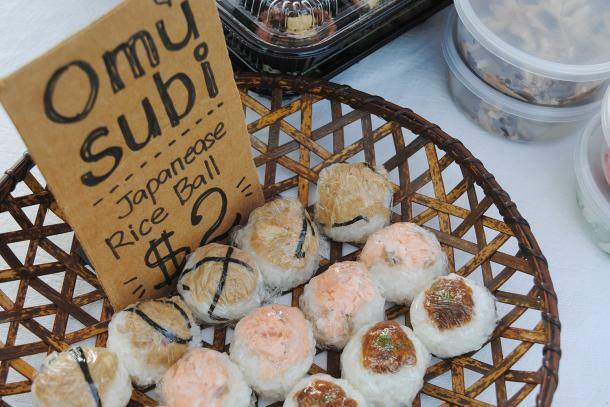 Want to add more umami to your life? Here’s a quick introduction to the products you can find at Aedan’s Saturday market stand, with some simple tips for enjoying them. Sweet with no added sugar, and naturally creamy without any dairy, amazake is a traditional Japanese drink made simply from mochi rice, koji, salt, and water. 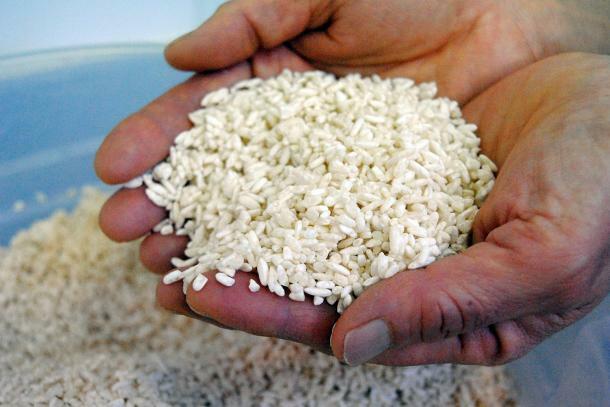 Once heated, koji releases enzymes that break down rice starches into sugars, creating a natural sweetness without the unhealthy repercussions of refined sugar. Add 2 to 3 parts hot water to drink amazake in the traditional Japanese way, or add fruit and freeze for a healthy “vegan ice cream.” Also great as a substitute sweetener while cooking. Your new favorite marinade! Add natural umami to vegetables and tofu, and tenderize meats as the koji enzymes break down proteins. Use 3 tablespoons shio koji per pound of vegetables or meats. Marinate for a few hours or up to a couple days for a stronger flavor and a tender, silken texture in protein-rich foods. Try marinating while vegetables are warm to activate the koji enzymes and bring out sweetness. Low in sodium, but strong in salty flavor, making for a great salt substitute. Popular among vegetarians and vegans. Pickle your favorite vegetables in as little as 30 minutes. Use 2 parts vegetables to 1 part sagohachi (in weight) for a sweet, umami-rich pickle. The excess water that collects after marinating vegetables is still full of healthy enzymes, so be sure to reuse it in a sauce or dressing to reap all the nutritious benefits. This is the type of miso you are probably most familiar with: light, lower in sodium, bright in umami, with a touch of sweetness. Wonderful for soups, sauces, and dressings. Fermented for 6+ months. A bolder, nuttier version of the white miso, thanks to the addition of barley koji. This miso was a finalist in the Good Food Awards, and is a Bay Area chef favorite. Fermented for 6+ months. A slightly sweeter version of the white miso. A boost in koji leads to a shorter fermentation time of just 1 month and an abundance of healthful enzymes. A chickpea-based miso for those soy-free eaters out there to enjoy all the health benefits and flavors of miso too! Japanese rice balls with various seasonal toppings using Aedan’s misos and marinades. Available only at the farmers market. A box lunch with a rotating assortment of fermented Japanese dishes made with Aedan’s products. It’s a great place to start if you’re looking to explore Aedan’s array of flavors. Available only at the farmers market. Heat sesame oil in a pan, and mix in your favorite miso, amazake, and sesame seeds. Incorporate well. Serve with cooked winter root vegetables, like daikon, turnips, and carrots.